I finally found a place to store some files, so here's a link to the original write up and original pictures that are no longer available in the first posts. Find all posts by Bob K.
Just joined forum. This is a great thread. 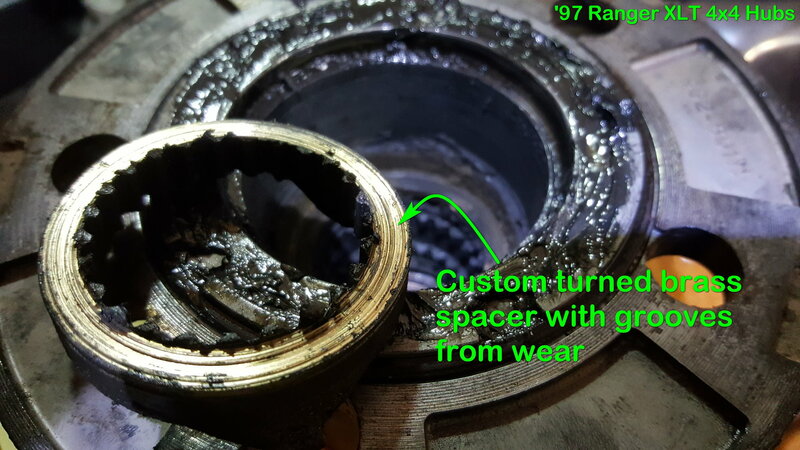 Here's a newer link to the entire directory, which contains other documents with even more discussion and pictures about how to diagnose and fix auto hubs. If you ever had any doubt about how hard Ford's design is on the auto hub components, check out this picture. This is the wear on the custom brass shims I installed in my hubs. They're significantly grooved after 51,000 miles of use and I had some fine dust and brass shavings inside the hub. Probably about 2,000 miles of that was with the truck in 4x4. I originally thought there was no way that plastic ring down inside of the hub could wear the underside of the pot metal cam but it now certainly looks like that is one hard piece of plastic! 35w DISTRIBUTOR QUESTION? BRONZE GEAR?